← Why was a CSI proposal removed from the Aquarius site? Since the BOD of Ilya G., Sofia F., Boris E. and Eugenia V. replaced John Y. and Joel C. in late July 2015, a curtain of secrecy has been drawn across our beloved Aquarius. We were promised that our Lobby would be completed by Christmas which with the on time completion of the valet deck and stunning water feature would make our dream of a partially restored Aquarius a reality. But Ilya, Sofia and Boris have repeated the project mismanagement of earlier boards. The trio has made the cardinal error in running a construction project themselves: they failed to have a general contractor in charge of the entire project, but rather have subjected us to a profusion of conflicting contractors without coordination and without a competent project supervisor, especially since the trio removed Andy Surdovel as manager – the only really good manager we have had in so many years – before the ongoing construction was completed. Remember the old adage: never change horses in midstream. A relatively simple project to restore the lobby (some drywall, a ceiling, ductwork etc.) 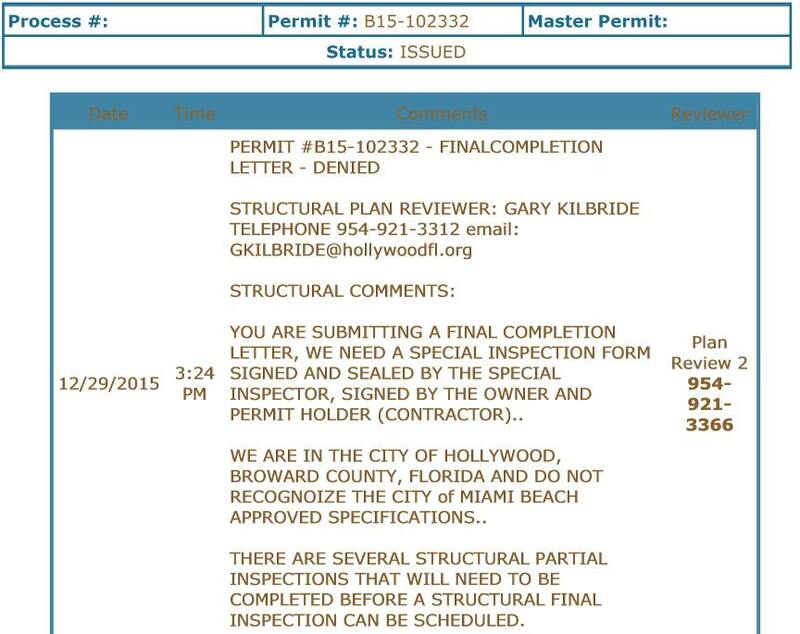 is stalled by problems with the City of Hollywood, contractors evading responsibility and invoice payments delayed. Contractors do not work if their progress payments are withheld repeatedly. What have we profited from illusory savings of dividing up tasks among a number of contractors just to have the frustration and increased expense of project mismanagement and repeated delays that very often result in poorer quality. Now the opening of the Lobby has no date of completion in sight. Just compare what has happened with the Valet Deck PROJECT that had one contractor CSI and has been completed on time and under budget. All we are left with is an illusion promulgated by the trio of saving money while our beloved Aquarius further falls into disrepair. Talking about results: has any one seen the contract for the Central Air Conditioning of the South and North towers? The plans, RFP with the bids and firm proposals from reputable firms were ready by July 2015. Andy Surdovel and the previous Board worked hard for it. Where is the contract for Air Conditioning? Where is the time line? What is the price we are going to pay? Are the funds ($375.000) provisioned by the Special Assessment enough? The last known estimate was of about $420.000. This new Board refused to work going after imaginary alternatives to save money. Money was not saved. Time wasted and the building under the threat of mold and mildew and legionnaire’s disease caused by poor ventilation and insufficient climate control. Why this “savings” behavior imagines that procrastination results are real saving? Does anyone value the time we waste in a building with growing problems? Secrecy, hesitation is what we have. It is time to change. You may register to receive automatic notices of updates from the City of Hollywood, Dept. of Development Services. The updates service is free of charge. This entry was posted in Construction & 40 Year Inspection, Contracts and tagged 2016, assessment, construction, Entry Area, Lobby, Project Updates. Bookmark the permalink. Cecilio’s blog is very important and appreciated, He is one of very few who analyzes and publishes. But he will forgive me if i take his some powerful expressions beyond the text. Other expressions shows how much he wants to return to the policies before “unfair” recall was done and how bad is the new board. You judge for yourself if you want to return the lost past. a *curtain of secrecy* has been drawn across our *beloved* Aquarius. Valet Deck PROJECT that had o*ne contractor CSI* and has been completed on time and under budget. *Andy Surdovel and the previous Board* worked hard for it. *Since* the BOD of Ilya G., Sofia F., Boris E. and Eugenia V. replaced John Y. and Joel C. in late July 2015, a *curtain of secrecy* has been drawn across our beloved Aquarius. The lobby delay came up at today’s construction committee meeting. Everyone knows that the delay came about because little if anything was being done according to CODE and the City of Hollywood came down hard on us. The lobby contractor(presumably licensed) stated he was specifically told by former manager Surdavel that the Board did “not want to spend the money and just put it back the way it was”. The lobby contract was signed and executed on July 20, 2015. 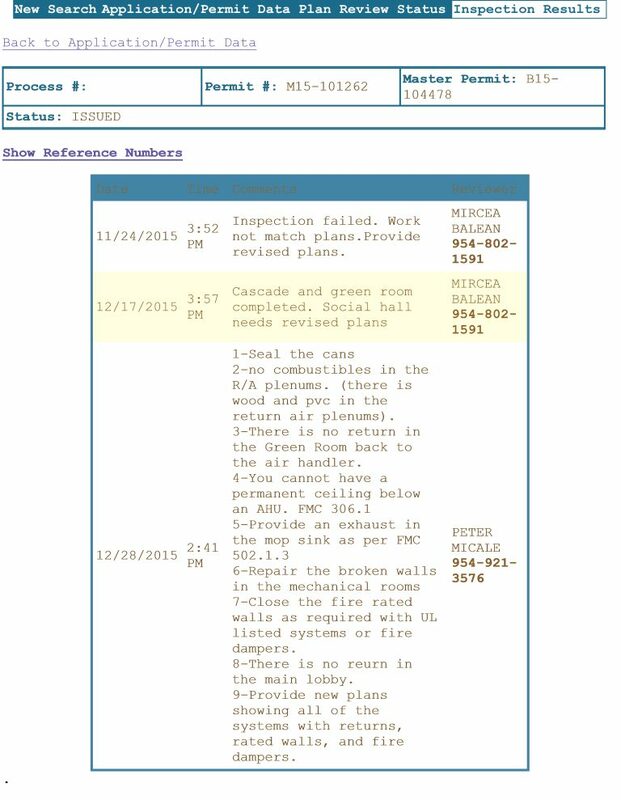 John and Joel were recalled on July 21, 2015. Try as they might the present Board cannot try to cast any blame for delay or non-compliance on the prior Directors. They are totally, completely at fault for the unconscionable delays we have had to put up with. In addition, to knowingly direct a contractor to violate safety and health codes is, at best, irresponsible.